If you’re a citizen of India then by now you must be aware of the importance of an Aadhaar Card. This card serves as a valid proof of identity and proof of address. An aadhaar card is also necessary for eKYC purposes, thereby letting you verify your identity electronically. This way you can complete the KYC process seamlessly and quickly while eliminating the need for any paperwork. One can utilise UIDAI’s eKYC service to instantly activate services such as new mobile connection, bank account or trading account. In order to authorise UIDAI to disclose your KYC information to such service providers, you can either use One Time Password (OTP) or biometric authentication. In case you’re registering for a service online, then using an OTP remains the only option. By sharing the OTP sent by UIDAI, the user allows the respective service provider to electronically access their details such as name, date of birth, address, gender, mobile number and photograph from UIDAI for verification. I’m not receiving an OTP for Aadhaar Card services, what should I do? However, the problem arises when you’re unable to receive an OTP for Aadhaar card on your registered mobile number. In this case, you won’t be able to complete the e-KYC process online unless you enter the OTP for verification. I encountered a similar situation while trying to download a copy of e-Aadhaar and adding my Aadhaar card to the mAadhaar app. 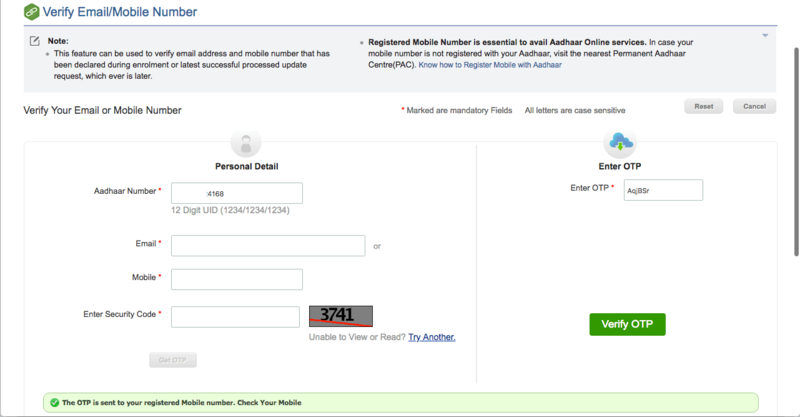 To my surprise, I was not getting an Aadhaar OTP from UIDAI despite having the correct mobile number registered in their database. I made sure that my phone number was active and there wasn’t any signal issue. I also verified my mobile number (declared during enrolment) successfully through UIDAI website but that didn’t work either. This will ensure that correct mobile number is updated in your Aadhaar card on which you’re expecting the OTP to arrive. To do so, visit uidai.gov.in and navigate to My Aadhaar > Aadhaar Services > Verify Email/Mobile Number. Enter your Aadhaar number, registered mobile number and security code. Then select ‘Get OTP’ and enter the OTP received to verify your phone number. NOTE: If you’re not receiving the OTPs from UIDAI even after verifying your mobile number then make sure to follow the below method. Initially, you might feel that doing this won’t help but don’t underestimate UIDAI’s customer care. I myself have tried this out and can assure you that it works. All you need to do is call UIDAI regional office in Bengaluru at 1947 (toll-free number). Upon contacting them, choose your preferred language in step 1. In step 2, wait until the IVR prompts you to press “9” to talk to an available representative. Press 9 to talk to their customer care representative and tell them you’re not getting Aadhar OTP at all. You can also mention that you’ve already verified your mobile number. The representative will now ask for your Aadhaar enrolment number. It’s highly likely that you won’t have the enrolment slip, so request them to verify your identity differently. They will now ask your details such as full name, date of birth, address, and father’s name. Upon sharing all this info, they will give you a complaint number which you must note down. Your concern will be forwarded to the technical team and the issue should be fixed in a few days. In my case, the issue was fixed within 2 days as I started getting OTP for my Aadhaar. Do note that you won’t be informed that the problem has been rectified. Tip: You can download mAadhaar app and try adding your Aadhaar card to it after around two days to check if the issue has been sorted or not. If the issue exists, then contact UIDAI again and share your complaint number to know the status.